When Ian and I got married, we chose our first dance song off an old Train album- never having heard the song played on the radio before. When we told people what song were going to dance to, no one knew it. A week after we got married, rights for the song had been released and it was being played every couple of minutes on the radio. We were so disappointed that our special song became so mainstream, not to mention, one of the most popular wedding songs of the year. When we finally settled on a name for our baby boy, we didn’t know a single ‘Graeson’. Not from celebrities, not in real life, not from friends of friends. Our ambition was to choose a simple, yet artful and unique name for our son-not completely “made up”, but, at the same time, we wanted him to be the only Grae in his school. 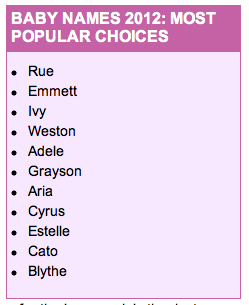 A few weeks ago, however, it was brought to my attention that I should check out the “Most Popular Baby Names of 2012 List”.